Are you all ready to meet another talented blogger? Meet Swati Goyal who blogs at Let's Cook Healthy Tonight and believes in cooking healthy and delicious food. I met her through Sonal who is a fellow blogger and we worked together on creating diabetic friendly recipes. I asked a few fellow bloggers if they would be interested in doing a guest post and she came forward and said yes. In spite of being busy moving and other things, she delivered what she promised. She brought a healthy dish called Quinoa Poha for all of us. As much as I know Swati, she is a very talented, kind, and warm hearted person. She has a lot of healthy recipes on her blog. One of my favorites is her Tandoori Aloo Tikka. Loved everything about it. Do visit her space and see for yourself. Hi ! I am Swati Goyal and I blog at www.letscookhealthytonight.com and I love to cook and love to take pictures. When few days back Sarika asked me do a guest post, I was so excited to share some space on her wonderful blog www.spicezone.com. It is really my pleasure to bring this recipe as a guest post for her. Thank you Sarika for letting me do that! I met Sarika through a DFT facebook group, where we worked together on creating healthy Diabetic recipes. I was always tempted towards the recipes created by Sarika as they were so healthy and creative. One of my favorite recipes on her blog is Nam Sod , A Thai minced chicken salad. Sarika is very talented and despite being working full time , she manages to take out time for her blog and creates awesome recipes. Most of her recipes are healthy and nutritious, so I decided to bring a healthy recipe for her guest post. Quinoa is one versatile grain which mixes with everything and enhances the taste of traditional recipes keeping the carb content low and protein content high. Also, the fiber content in Quinoa is what gets many people interested in eating it. With many other nutritional values as well, this super grain is finding its place in the menu of many health food lovers. It is very good for weight loss, cholesterol control as well as diabetics. 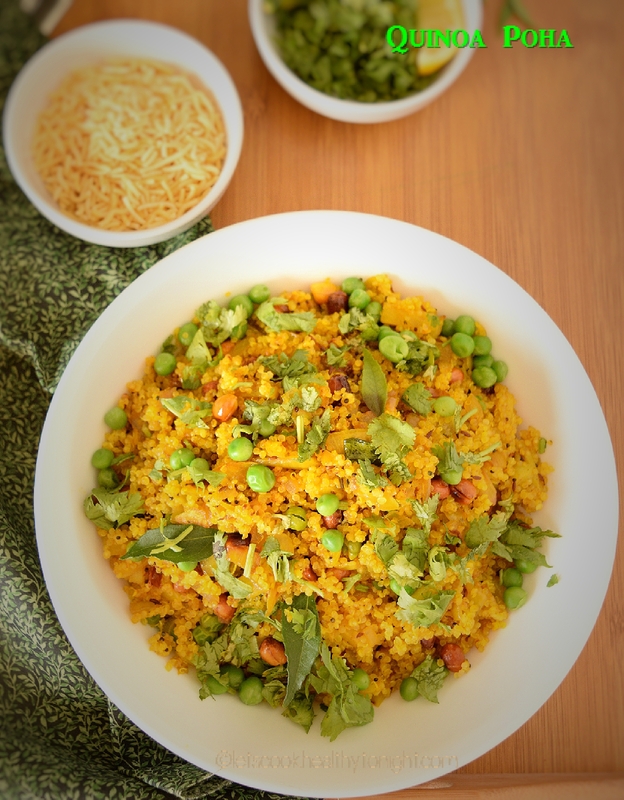 I tried making Poha with Quinoa and it came out so well that I would never make the traditional rice poha again. Trust me, I am not exaggerating , Quinoa Poha tastes far better than rice poha and it is so less in carbs too. 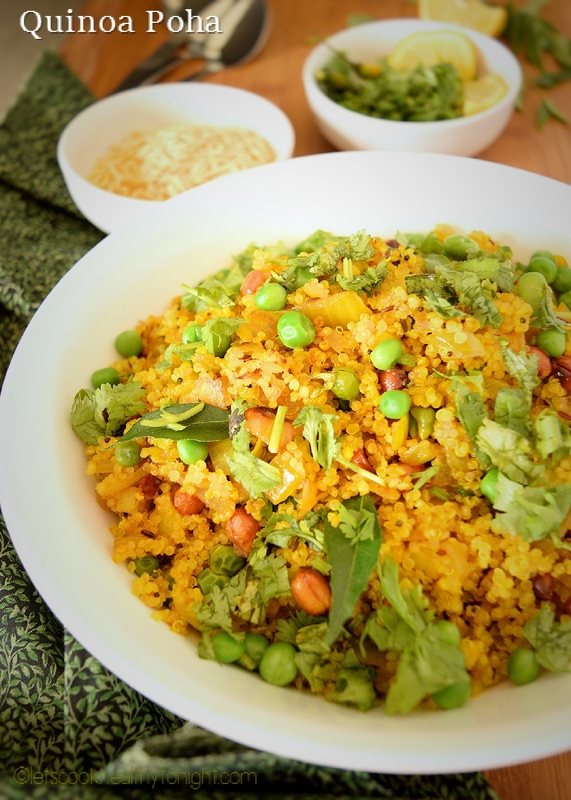 Aren't you tempted to make Quinoa Poha now? Place the Quinoa in a strainer and place it under running water. This way it will be washed. Heat 2.5 cups of water in a pan and once the water starts boiling, add the Quinoa. Cover the pan with lid and cook until the quinoa is completely cooked. Once the quinoa is cooked , take it out in a plate and let it cool down.In another heavy bottomed pan or Kadhai, heat some oil. Once the oil is hot roast the peanuts in the oil. Once roased take them out. Now add the remaining oil and let it become hot. Once hot, add the chopped potatoes and fry them till they are cooked too. Take them out and keep them in a plate. At this time add the remaining oil and add musturd seeds and let them crackle. Now add onions, green chiles and curry leaves and saute until the onion becomes transcluscent. Add the turmeric powder, chili powder, salt and mix everything well. Add the cooked Quinoa, boiled green peas , fried potatoes, peanuts and mix well. Add few drops of lime juice and chopped coriander and serve hot with a cup of hot tea or coffee and enjoy ! Thank you Swati for sharing this healthy yet yummilcious recipe. Quinoa Poha, protein packed snack which can be eaten at any time of the day instead of the traditional rice poha for health conscious people. 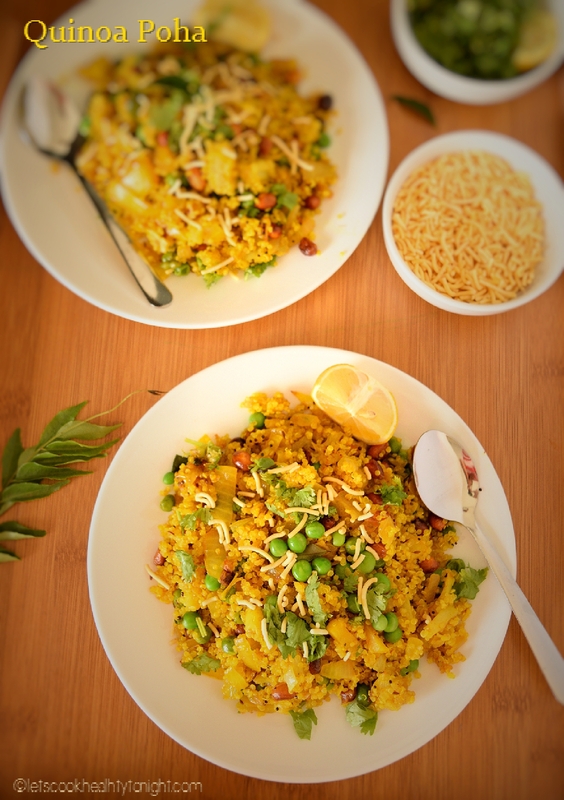 3 Responses to "Guest Post: Quinoa Poha by Swati Goyal"
This sounds so delicious! I can’t wait to try it! I know right Salma, I am gonna try it too soon.